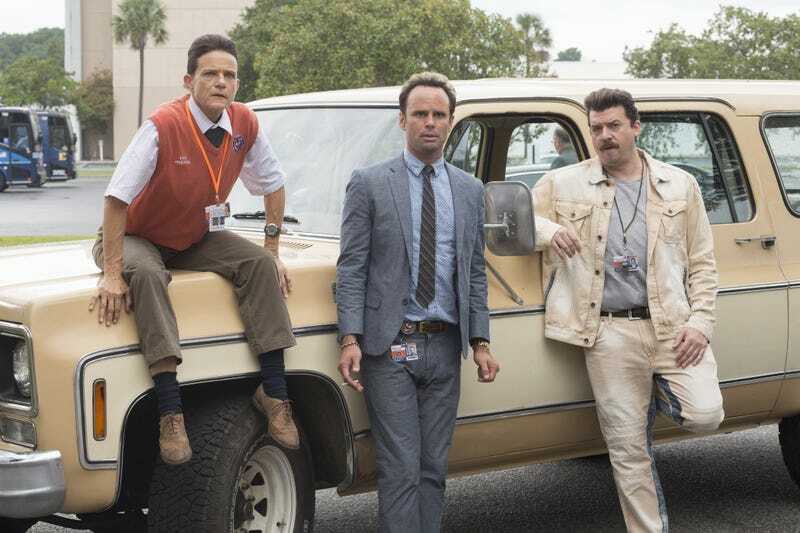 Vice Principals has spent a fair amount of time in its second and final season pitting Neil Gamby and Lee Russell against each other. Despite their shared destruction of Principal Brown in the first season, they’ve largely been on different teams, be it because of their outlook when it comes to North Jackson High or because, after Gamby was shot, Russell was handed the Principal’s job. As this season has progressed there have been hints that the division between the two would lead to a monumental showdown by the time the series wrapped up. It was looking more and more like Gamby was, intentionally or not, gunning for Russell’s job, and “The Most Popular Boy” makes that explicit when Ms. Abbott turns more sinister than before, doing everything she can to oust Russell and position her new boyfriend as the next in line for the job. In fact, “The Most Popular Boy” is all about how everybody is going against Russell, and more than that, the show suggests that he deserves it. His marriage is falling apart, he can’t stop lying, and all of the teachers hate his guts. Meanwhile, Gamby is sleeping with Ms. Abbott, he’s getting a style makeover, and he’s been invited to Pay Day Drinks, a sacred rite of passage for anyone looking to be part of the popular teachers group. The Gamby-Russell dynamic has shifted. They’re no longer united by their outsider status. Now, Gamby is making the teachers laugh during a presentation and getting under Russell’s skin, like all the cool kids do. Of course, Russell’s home life isn’t any less divisive. Two attempts at quiet, peaceful meals turn into moments of personal reckoning. The first meal is pure comedy, with Christine and Russell trading hateful barbs under the guise that honesty is the best policy. “Fine, honesty check: these scrambled eggs are hard as hell, and they taste wretched. See, honesty is not always the best policy,” says Russell before telling Mi-Cha that she looks like “death warmed over.” It’s a hilarious scene that also shows just how far gone this relationship might be. That idea is underscored later, when Russell offers to make dinner. After everything goes so well and both him and Christine seem to be getting back on track, she finds the takeout containers in the garbage. Russell cannot stop lying. It’s his major flaw. He believes the ends justify the means, never understanding that “it’s the thought that counts” doesn’t apply when you’re actively trying to fix your marriage. “The Most Popular Boy” uses those two scenes with Russell as a contrast to Gamby’s evolution. He’s fitted with new clothes—Ray says he has “a real Max Headroom thing” going on—he’s sitting with the teachers at lunch, and even Snodgrass seems to be drawn to this new version of him. Ray gives him a warning though: “Hume said that patriotism and popularity are the beaten road to power and tyranny.” The words of wisdom go right over his head though: “See, I knew Ray would understand.” All of this is to say that “The Most Popular Boy” spends most of its runtime setting us up for a confrontation between Russell and Gamby. Perhaps it wouldn’t be physical, but as Gamby prepares to go out for Pay Day Drinks, and Russell fights with his wife, all signs point to this being the turning point in their relationship. “The Most Popular Boy” doesn’t go down that road though, and to say it’s a pleasant surprise would be to understate just how comedically and emotionally effective the final stretch of this episode is. Everything that’s been simmering all season long finally boils over. There’s Ms. Abbott getting up in front of everyone at the bar and declaring her love for Gamby and sealing their relationship with a rendition of “Escape (The Pina Coloda Song).” There’s Gamby inviting Russell out despite knowing that the teachers won’t approve, risking his own admission into the group in the process. Ms. Abbot writes off the invitation as Gamby wanting everyone to make fun of Russell, but we know that’s a lie. Then there’s the big reveal: the teachers haven’t been preparing their students for the upcoming test evaluations. Instead, they hope that their neglect leads to bad scores, which means Russell will get fired. All of this should be welcome news for Gamby, but he’s not the same man he once was. He knows that what the teachers are doing is wrong, but he’s not sure if he can do anything about it. But, when he drives Russell home and discovers that the house is empty, that Christine has left his (sometimes reluctant) best friend with nothing, he knows he can’t turn his back on him. He knows that no matter what Russell has done, he doesn’t deserve all of this. It’s rather touching actually, and watching Gamby, Snodgrass, Nash, and Russell work together to correct the test mistakes and get them in on time is legitimately joyful. It’s the full Gamby face turn we’ve been waiting for, and it puts him and Russell, and more importantly Snodgrass, back on the same side, at least for now. It’s a swerve that feels true to the story this season has been telling, and beautifully sets up the conflicts that will surely dominate the remaining three episodes. I love this week’s cold open. Ms. Abbott kicking out Gamby’s window, and telling Nash, “you know what you saw, we’re in love” had me howling. Edi Patterson is a treasure. While Gamby, Snodgrass, Russell, and Nash are quick to celebrate getting the tests in, I’m not convinced that Vice Principals won’t pull the rug out from under them, having them find out that they didn’t get the right answers, or something along those lines, in the next episode.